The U.S. Coast Guard Cutter Bertholfarrives at Joint Base Pearl Harbor-Hickam, Hawaii, in preparation for the Rim of the Pacific (RIMPAC) exercise 2018. The Coast Guard’s national security cutter (NSC) has quickly proven itself as the most capable cutter in the fleet based on extremely successful deployments in the Atlantic and Pacific oceans, and even up into the Arctic. Known as the “Legend class,” with the ships being named after famous Coast Guard people, the original program of record was eight NSCs to replace the 12 378-foot Hamilton-class high-endurance cutters. But Congress has funded 11, with nine of them built or ordered, and contracts with the shipyard, Huntington-Ingalls of Pascagoula, Mississippi, have been made for long lead-time materials for the 10th and 11th. The 378s entered service between 1967 and 1972, and so were much in need of replacement. 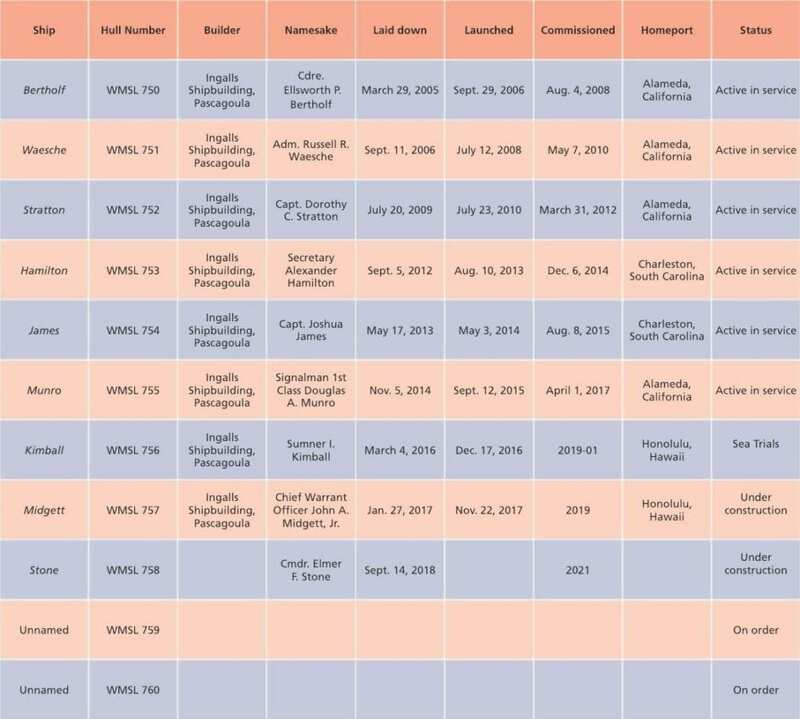 As of this writing, three remain in active service with the Coast Guard, with the remainder decommissioned and transferred to foreign navies and coast guards in Nigeria, the Philippines, Sri Lanka, Bangladesh, Vietnam, and Nigeria. At 418 feet in length and displacing about 4,500 tons, the NSCs are larger and more capable than the 378s. The NSC has a range of 12,000 nautical miles, and an endurance of up to 90 days for independent patrols. They can be refueled at sea to extend their deployments, as well as be integrated into naval operations. The NSC has improved seakeeping and can launch and recover small boats more safely and efficiently from the stern. It also has a flight deck and hangars for helicopters and unmanned aerial vehicles. The lead ship of the class, CGC Bertholf, was commissioned in August of 2008. The seventh NSC, Kimball, will be commissioned at her new homeport of Honolulu, Hawaii in January 2019. According to an October 2018 report by the Congressional Research Service, the NSC has an estimated average procurement cost of about $682 million per ship. The NSC’s weapons are furnished by the Navy. Stratton has the same 57 mm gun as the Navy’s littoral combat ship, and the Phalanx CIWS, which is also found on the Navy’s cruisers and destroyers.